When the Black Swamp in Bowling Green, OH was drained 100 or so years ago no one ever dreamed of a $5,000 flat-screen, multimedia entertainment system next to a pool table on a plush white carpet floor, all sitting 8 feet below the water table. Nowadays many a family spends its time in just such an environment. Gearhart can help prevent water damage to your valuables with our alternative sump pump systems. Whether you've experienced a black swamp in your basement, or are looking to prevent one, Gearhart can keep ground water and black water from collecting in your home. 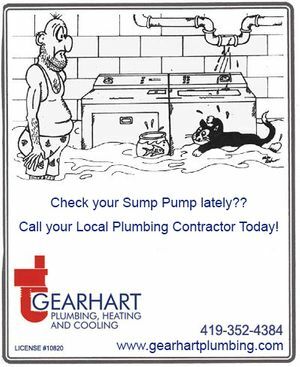 Call Gearhart to discuss the wide range of sump pump alternatives to protect your lower level.